The first international symposium on mathematical foundations of the finite element method was held at the University of Maryland in 1973. During the last three decades there has been great progress in the theory and practice of solving partial differential equations, and research has extended in various directions. Full-scale nonlinear problems have come within the range of nu­ merical simulation. The importance of mathematical modeling and analysis in science and engineering is steadily increasing. In addition, new possibili­ ties of analysing the reliability of computations have appeared. Many other developments have occurred: these are only the most noteworthy. 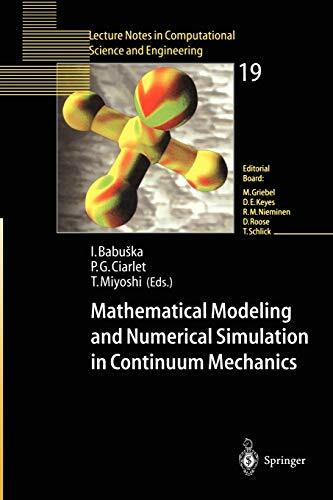 This book is the record of the proceedings of the International Sympo­ sium on Mathematical Modeling and Numerical Simulation in Continuum Mechanics, held in Yamaguchi, Japan from 29 September to 3 October 2000. The topics covered by the symposium ranged from solids to fluids, and in­ cluded both mathematical and computational analysis of phenomena and algorithms. Twenty-one invited talks were delivered at the symposium. This volume includes almost all of them, and expresses aspects of the progress mentioned above. All the papers were individually refereed. We hope that this volume will be a stepping-stone for further developments in this field. This book shows the latest frontiers of the research by the most active researchers in the field of numerical mathematics. The papers in the book were presented in a symposium at Yamaguchi, Japan. The subject of the symposium was mathematical modeling and numerical simulation in continuum mechanics. The topics of the lectures ranged from solids to fluids and included both mathematical and computational analysis of phenomena and algorithms. The readers can study the latest results on shells, plates, flows in various situations, fracture of solids, new ways of exact error estimates and many other topics.